On Main Street in the famous Yorkshire town of Haworth, you are transported back in time to the Victorian era – a time when the local apothecary was stocked with an array of curious items and the owner dispensed out medical advice along with the herbal cures and medicines. The family-owned Cabinet of Curiosities shop was restored to its former glory 30 years ago and over time has been furnished with beautiful, antique shop fittings and fixtures that have been lovingly sourced and renovated. 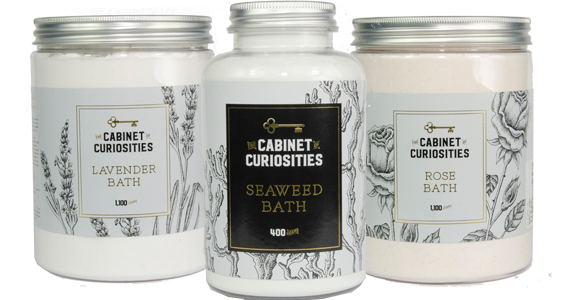 The shop has now launched a new range of bath salts and powders inspired by the atmospheric interior and all the history that surrounds it. The bath salts and bath milk are hand-mixed and infused with natural oils and pure ingredients to soothe and relax or refresh and revive. On launching the new products, a brand refresh was also introduced, incorporating bespoke black and white illustrations and a new logo design. The introduction of a key icon ties into the core concept message of ‘Unlocking your Curiosity’ and gives the brand mark the strength it needs to stand out on the shelf. Rose found that the choice and quality of digital print had improved significantly over recent years and that metallic stocks are now available that offer a cost effective solution for an eye catching print finish. The bath products are currently available in their shop in Haworth or online via their website. Future plans include a range of candles and home fragrances. What Present Should You Pick for a 50th Wedding Anniversary?